This post covers the two previous post I have written on using an ML-enhanced EOSM to 'simulate' a medium format camera. For those of us that use Tilt & Shift lenses, I have the 24mm TSE Mk II, we are lucky enough to be able to do, what I call ‘sensor bracketing’: that is keeping the lens stationary and shifting the (camera) sensor by, say, +/- 12mm. 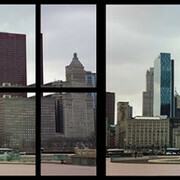 Thus, say, allowing a pano to be created with (36+12+12 = 50mm) x 24mm (sensor) aspect ratio. Or a (24+12+12) x 36 ratio: as well as a few more complicated arrangements. However, the Canon TSE 24mm is some $2000, although there are cheaper tilt/shift options as well, eg the Rokinon equivalent is ‘only’ about $750. As well as other shift-only adapters. But what if you wanted to shift even more, say emulating a 645 Medium Format sensor through shifting, or as I call it ‘sensor bracketing’? 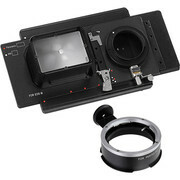 This is where the Fotodiox RhinoCam 645 Adapter family comes in. There are two Canon versions. One allows you to use any EOS camera (at about $300) and the other allows you to use the EOSM (at about $200). As for lenses, you can use either Hasselblad H, Mamiya 645 and Pentax 645 Lenses. As I have EOSMs operating in both the visible and IR bands, I decided to go the cheaper route and purchased the EOSM version for a Mamiya. To be clear, this is not a technical camera, with front and rear standards, (but I hope to use ML doing this in time), but I am using a Mamiya 645 lens (I have a 45mm FL F/2.8 at the moment) and couple this to the Fotodiox RhinoCam adapter (https://fotodioxpro.com/collections/lens-mount-adapters/products/rhinocam-eosm), to create a ‘virtual’ medium format sensor back (my EOSM) through, as I say, what I call, ‘sensor bracketing’. The limitation of the approach is you require time to capture the medium format data, thus the technique is best suited for images where objects are not moving (by much) and/or you can tolerate movement, eg LE work. I already had a 645 45mm lens, which I use with my Fotodiox (variable) ND Throttle on my 5D3 (or EOSM via an adapter). BTW the Throttle allows one to have the benefits of the variable ND, without the X effect you sometimes see with using a WA lens and a variable ND on the front of the lens. But why bother with the RhinoCam? On a more serious note this approach allows one to capture images for large prints, either ‘full’ 645 format (8 EOSM captures) or high resolution panos (6 EOSM captures), for high quality and/or large printing, ie competitions/exhibits etc. 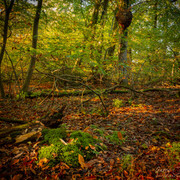 Unlike other approaches, eg pano heads etc, there is no distortion with this approach, as the lens remains fixed. If printing at 300 dpi quality, using the native 3:2 ratio EOSM equates to a print that would be about 17.6x11. inch print. As for setting up the shot, an acceptable 645 hyperfocal distance (for now ignoring diffraction and using George Douvos's excellent TrueDoF-Pro App with diffraction on) is to use a (defocus) Circle of Confusion of 47 microns at F/20, is about 3.3m. Note we can use such small apertures as we are shooting medium format, albeit via 'sensor bracketing'. However, we wish to do better than an infinity defocus blur of 47 microns, so we will half that to, say, 23 microns, giving a focus point at about 4-5m. So let’s cut to the chase. How does one use a 645 adapter? Plus, how does one post process the captured (sensor) bracket set? First it is worth noting that the latest Lightroom and Photoshop CC can automatically stitch an exposure bracketed, pano set. Thus, in addition to the sensor brackets, one can factor in exposure brackets at each sensor bracket point, and, in post, push one button to process the bracket set. But be warned you need a computer that can take large images (speed and RAM). Plus, to really give you a headache, you could also focus bracket as well! Thus one, full, 645 image, using the EOSM Fotodiox set up and, say, three exposure brackets, and two focus points, one final image would be composed of 8 (for the sensor bracketing) x 3 (for the exposure bracketing) x 2 (say, for two focus bracketing sets) images: that is 48 images! As I say, fun stuff. But let’s keep things simple for now and ‘just’ take a full 645 image using the Fotodiox adapter, ie 8 Dual-ISO sensor brackets. I had to compose the image, upside down, so this really feels like ‘old photography’ [:-)], using the adapter’s viewing ‘screen’. I manually set focus on the lens (having first calibrated it at the required distance); having set the aperture on the lens to F/22. I then moved the camera to ETTR the brightest part of the image, using Magic Lantern. BTW according to the needs of the scene, eg by reviewing the test image, I would now take additional exposures at: a fixed setting; set Dual-ISO; or use the ML bracketing, ie set to +, ++, +++ mode from the ETTR base. I then took the required ‘sensor brackets’ at the 8 indicated positions on the Rhiocam. Here is a (scaled down) version of the resultant test image. Bottom line: once again ML helps us push our cameras to ever greater heights. For example, using a (cheap these days) EOSM, coupled to a (relatively cheap) 645 second hand lens and the (cheapish) RhinoCam adapter: we can take high dynamic range medium format images, allowing us to create huge prints! Interesting new idea and innovation, Garry! Amazing detail! Keep going! This video keeps popping up on my YouTube recommended list so I finally watched it. I think you'll appreciate it. Pretty much what you're doing except in motion! Very interesting, as it deals with motion. I must say the RhinoCam is a simply way to do it for me, but the video set is more ‘professional’. As I said, it was really a bit of fun. But I will try and create some ‘art’. Pretty much what you're doing except in motion! Sometimes, reinventing the wheel could be quite useful. This process makes people think and new ideas are generated. Thus, small steps often turn into giant leaps. The best example for that is Magic Lantern. It started with a few small steps and now is, in my humble opinion, the most gigantic leap in photo technology since the invention of the DSLR. So, just keep going, Garry! Thanks Garry for making it very clear with the detailed explanation. Looks like a miserable day weather-wise, so I decided to 'play around' with my visable-band & IR-band digital (EoSM) backs on my 645 Vizelex RhinoCam system. I've developed an ML-based work flow that also gives me an extended DoF via focus bracketing with the sensor bracketing. First, I used ML’s ETTR to help me select a suitable exposure for the highlights. I then use the 'Rule of 10', which says that if I use an aperture of F/10 and focus at 4.5m (45mm/10), I’ll be at the hyperfocal with a CoC of 45 microns, ie the FL in microns. From there I may adjust things as required. For example, I could add some background focus insurance and set the focus to 6m, ie rather than the theoretical 4.5m. Note that, because we are using a 645 format, I can also push the aperture more than we would with a 35mm format. Thus I could go up to F/20 with my visible band EoSM back, but ‘only’ F/18 with my IR EoSM back. BTW the Vizelex RhinoCam system needs to take 8 images (sensor bracketing) with the EOSM in portrait mode, which gives me the opportunity to adopt two focus strategies. That is I can pseudo focus bracket as well as sensor bracket in the same image. If required I could also exposure bracket at each sensor bracket, eg using a Zero-Noise bracket at, say, 4Ev; that is if a single exposure wont hack it. I then take the top four sensor bracket images (with exposure brackets if required). Having then repositioned the system for the bottom row of sensor brackets, I then refocus at the H/3 point, ie to extend the DoF in the foreground from H/2 to H/4. For example, I refocus the lens to around 2m, ie 6/3. After ingesting into Lightroom, I simply use the LR Merge capability. As an example (indoor) test shot, I used my visible band EoSM and ETTRed for the highlights, at ISO100 and at F/16. Giving a base exposure of 1.3s. I set the ML Auto bracketing to 2 images and +4Ev to create a single ‘zero-noise’ bracket for the shadows, ie at shutter of 20s. 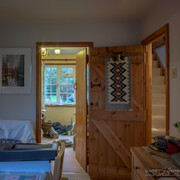 After ingesting into LR I tried to use the combined HDR-Pano merge in LR, but this failed on my laptop with an ‘error’ of not enough matching images. I therefore resulted to doing a two-pass merge process in LR: HDR the exposure brackets first, then do the pano merge in LR. Finally, I tweaked the image for ‘look’. The resultant test image is a 283MB, 9367x8865 TIFF image, that, in this rendition, is JPEGed down to 4Mb! I hope some have found the above of interest and as usual I welcome any feedback. I absolutely always find myself in awe while it’s fascinating especially when reading through your fantastic hobbies that you share with us occasionally from time to time (often may require to double/triple read for someone like me) and nevertheless please don’t ever change who are @garry23!